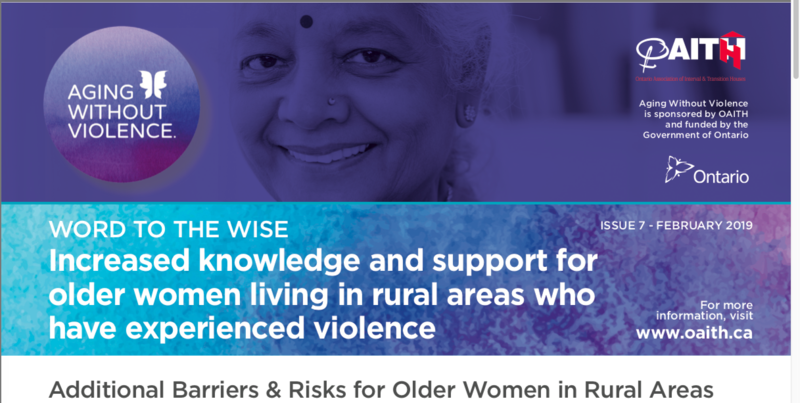 The Aging Without Violence (AWV) project is guided by an inter-sector provincial advisory including stakeholders with expertise in violence against older women, public education, service provider training, research, and improved community responses. Now in its sixth year, shelters across the province are engaging the community to become more aware of the often overlooked issue of woman abuse in Ontario. November is Woman Abuse Prevention Month. The purple scarf is a symbol of the courage it takes woman leave her abuser. However, the courage of the woman is not enough. It takes the strength of an entire community to end violence against women. In 1995 OAITH began tracking women and their children who’ve been murdered by their partner, previous partner, family members, or other men close or known them. Femicide is broadly identified as the intentional murder of women by men. Each year OAITH releases a list of names reported on by the media in Ontario to remember and bring attention to the issue of violence against women. OAITH, in partnership with Dr. Mavis Morton at University of Guelph critically examine media reports of femicide using 5 positive and negative frames to evaluate and analyze media reporting.